I have done the Grimm Brothers and mock trials with groups of special education middle school students (ADHD, Autism Spectrum, NVLD, etc) for several years now and they always say it's one of their favorite activities. This PDF document includes two scavenger hunts, six writing assignment guides and two models for a unit on the Grimm Brothers and mock trials. We use the "scavenger hunt" to practice "hunting" for and annotating text-based evidence. 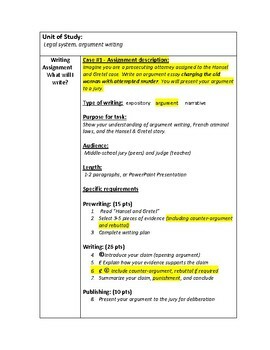 I have six different writing assignment guides for the cases available, so I can differentiate for students and assign them a case that fits with their abilities. 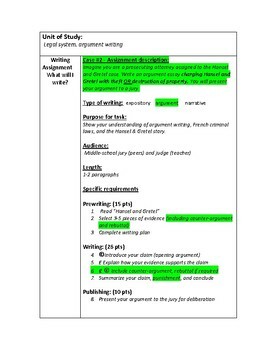 Based on templates from Keys to Literacy, each case include a color-coded prompt, assignment specifications, and steps of the writing process. 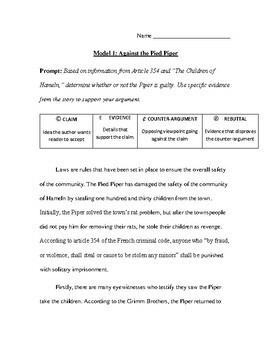 I am also including two model argument essays about the Pied Piper of Hameln.